Become an accredited Registrar. Click here. We have recently added a new function to our Toolkit API. This function returns a list of domain names scheduled to be deleted from the registry database within the next five calendar days. This feed may be of use to registrars who offer "drop catching" services to their customers. For more information about this function, please see http://toolkit.centralnic.com/doc/deletion_queue. Don't forget to take advantage of our specials while they are still available! If you missed out on the start of our great offers...don't worry - there's still time to make extraordinary profits. Get in touch with your Account Manager to take full advantage of these once-in-a-lifetime reductions. CentralNic is delighted to announce that .UK.COM will star in a new marketing program starting this September, focused on why premium clients like Hackett, Avon and Pineapple Dance Studios prefer .UK.COM domains. So make sure that UK.COM is displayed prominently on your website when customers come looking for it. 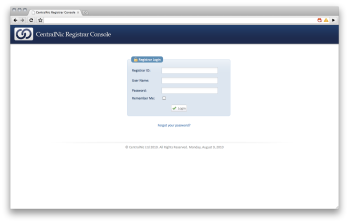 Our new Registrar Console is almost ready, so we thought you might enjoy some screenshots of the new interface. We've worked hard to make the user experience as simple as possible: as with the best software, you should find that "it just works!" As part of the continuing roll-out of .ru.com and our other domains through the Russian Federation, CentralNic's Head of Business Development, Mar Perez, will be presenting at the third international conference for ccTLD Administrators and Registrars of the CIS, Central and Eastern Europe. http://meeting2010.cctld.ru/eng/ If you are attending, please come and say hello! Short of inspiration for marketing CentralNic domains? We are conducting a review of our EPP system to ensure that we fully comply with the RFC documents. As a result we may need to make some changes to our EPP system: registrars will be given plenty of time to test the changes in OT&E and update their client systems if required. We will notify you when these changes are scheduled. If you have come across anything in our EPP system that is not compliant with the RFCs, please let us know by emailing epp@centralnic.com. One of the world's oldest domain registries, CentralNic supplies domains at a growing number of extensions, currently numbering 23 and including .us.com, .uk.com, .cn.com, and .la, sold via an integrated global network of 2000 registrars and over 100,000 resellers. CentralNic's powerful registry engine has a fifteen year track record of uninterrupted secure supply of domains, supported by innovative marketing and personalised customer service. CentralNic is also an active investor in new online businesses. Its portfolio businesses and joint ventures include Central Registry Solutions (a joint venture with Network Solutions to enable new Top Level Domains), IP alarm company Emizon, and premium email names service Emailme.com. Comments or questions about this newsletter? © 2010 CentralNic Ltd. CentralNic is a company registered in England and Wales with company number 4985780. Registered Office: 35- 39 Moorgate, London, United Kingdom, EC2R 6AR.